Several species of tilapia and their hybrids are farmed throughout the world. The nile tilapia (Oreochromis niloticus) is a species commonly farmed in the United States. There is evidence to suggest the Egyptians raised tilapia in ponds over 3,000 years ago. 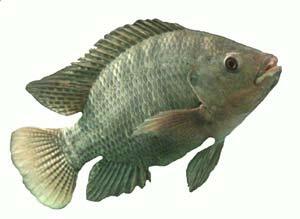 Tilapia are also called "Saint Peter's Fish" because it has been said that they were the fish Peter caught when Christ told him to cast out his nets in the Sea of Galilee. Tilapia have several attributes which make them attractive as a culture species: high tolerance of poor water quality and crowding, good performance on commercial catfish feed (32% protein), a high degree of disease resistance, and a mild flavored, white flesh. Because of their tolerance to crowding and poor water quality, tilapia are well suited to cage culture and recirculating systems. Research has also shown that in addition to controlling filamentous algae, tilapia stocked in channel catfish ponds can help control off-flavors by eating blue-green and other large planktonic algae. Tilapia have a good growth rate. A 2 to 4 ounce tilapia fingerling can reach 3/4 pound. by the end of a temperate growing season. Tilapia performance is best in a temperature range of 72-90ºF. Growth and feeding slow when water temperatures drop below 70ºF. However, tilapia are cold intolerant and die when water temperatures are lower than 45-55ºF. Blue tilapia will survive in lower water temperatures (above 45ºF) than most other species of tilapia. The pond production season in Kentucky would begin in late April and end just before the middle of October. Therefore, tilapia marketing would be seasonal and within a week or two of the same time each year. Indoor culture of tilapia in recirculating systems could extend the growing season.